How can we miss him if he won't go away? 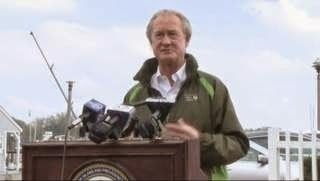 Proving once and for all he is completely delusional, Lincoln Chafee announces he is exploring a Presidential run for 2016. Our beloved "Gump" will hit the national stage and challenge Hillary for the Democratic nomination to run for President of the United States. Chafee , who has become the state punchline , had the impressive approval rating of a whopping 25% when he decided to not seek a second term as Governor. Chafee basically ran the state into the ground and now he promises to do the same for the entire country. The Chafee years were painful with high unemployment, no direction, no leadership, and a war on Christmas. Chafee ought to be a big hit in Iowa when he announces his first order of business will be taking down the White House Christmas tree. Will Chafee draw huge crowds in New Hampshire when they catch wind of his failed tax plans? Yes, huge crowds of voters running away from him. It is beyond comical that Gump actually thinks he is qualified to run for President when he was clearly over his head as governor. Chafee was not bad as governor he was a disaster as governor. How do you run for president when 75% of the voters in your home state are against you? Chafee is a horrendous public speaker, horrible at retail politics, he has zero charisma and has no personality or likeability. Politics in Iowa and New Hampshire are up close and personal and that is where Chafee is the weakest Linc. If he wins, does Mollis get to live in the White House?